KILDARE’S Daniel Flynn has been named as the GAA/GPA Footballer of the Month for the month of June following two superb performances in the Leinster Championship, against Laois and Meath. 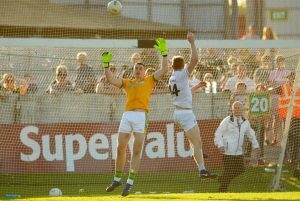 There was a long wait for Kildare supporters to see the 23 year old Johnstownbridge man in Championship action but it was worth their patience. After making four Championship appearances in 2013, a spell in the AFL with Port Adelaide and some inconveniently timed injuries meant he had to wait until this season’s Leinster quarter-final against to finally wear a white jersey in the Championship again. He wasted little time in making an impact. He scored 1-3 in Kildare’s win, with his second half goal putting the tie beyond doubt. Flynn then went one better in the semi-final against Meath and notched 1-4. Again, David Slattery set him up for a second half goal that settled the game as a contest. After his sojourn from the team, Flynn is now one of Kildare’s key men and his player of the month award cements his place as one of the most exciting talents in the country. He has now scored 7-23, all from play, in 26 appearances for Kildare, 2-9 of that in seven Championship games.